← Molly (now Twinkle) update…. look at her now! Too long ago now we took in 3 working Jack Russells, 2 brothers and their sister. 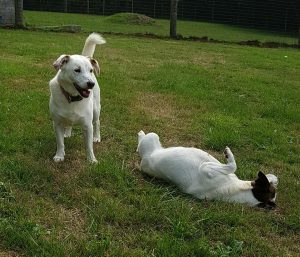 At 8 years old, they are still very fit and active. The pictures show Tyson (the mostly white dog), and his sister Minnie. These dogs have been frequently passed over-many felt anxious that they were workers, not traditional ‘pet’ dogs, and wouldn’t settle as pets. People were reluctant to take a chance on them, until a few weeks ago when their brother, Bruno, found his forever home. We have been thrilled to learn that Bruno has settled well into home life, and is enjoying being a pet dog. He is adored by his new family. Bruno is a bit of a diva who loves being the centre of attention. Bruno has shown that they can adapt to home life very well. If you love Jack Russells, these stunning dogs are old school-handsome, strong and sturdy. 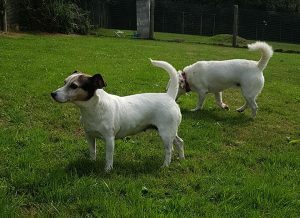 Minnie and Tyson would love a home together, with a secure garden to run in, and adults only owners who enjoy being active. It would make my year if these two could find the right home where they could be together.